Develop your air sense as the captain of a dirigible in the Airship Mistress Corset with Jacket and Belt! 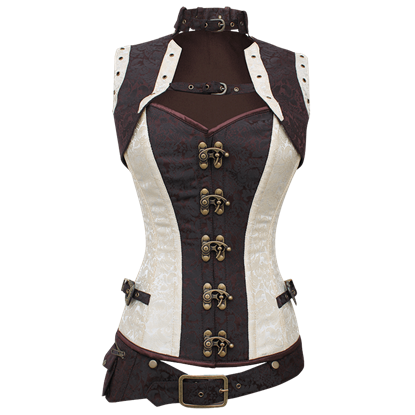 This steampunk sweetheart overbust corset has many flexible wear options with its detachable belt and jacket. Batten down the hatches! Featuring a demure sweetheart neckline, the Antique Map Overbust Corset displays an explorers map print over its design. The tan background emulates an aged look, while map markings and notes cover the fabric. This highly detailed steampunk corset will leave onlookers picking their jaws up off the floor. This Belted Brown Steampunk Overbust Corset features a rich design that sets off a womans curves as well as her Steampunk style. The resurgence in popularity of corsets results from their ability to flatter the figure and their innate sophistication. 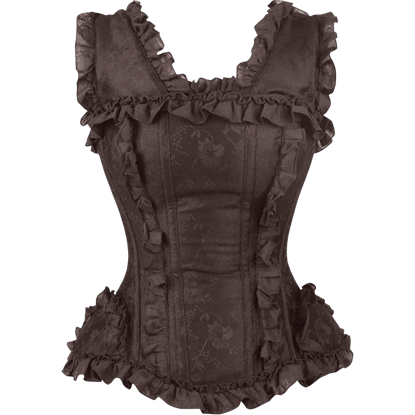 The Brown Brocade Sweetheart Overbust Corset hugs your waistline in its elegant design. 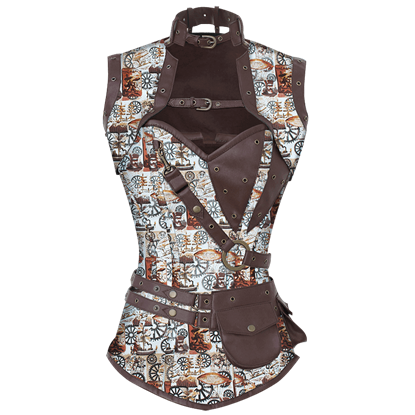 Accent steampunk ensembles and more with the Brown Cotton Overbust Corset. Incredibly versatile in its no-frills style, this steel boned corset will help you achieve a timeless hourglass silhouette with straightforward sophistication. Offering a glamorous look with its gorgeous style, the Brown Vinyl Overbust Corset is the perfect accessory for steampunk and apocalyptic fashions. The sleek brown overbust corset creates a stunning hourglass silhouette. Embody the charming elegance of antique times when you wear the Burlesque Brocade Brown Overbust Corset. Sweet ruffles highlight the thick shoulder straps, bodice, and hips of this waist-cinching, Victorian-inspired corset. There is a certain freedom that can be found on the seas, but the ultimate adventure remains the sky. And in your Captain Of The Skies Overbust Corset, you will look ready to command your crew to greatness as you sail unhindered across the sky. Traditional steampunk style combines Victorian fashion with industrial style to deliver a look that is nothing less than jaw dropping. 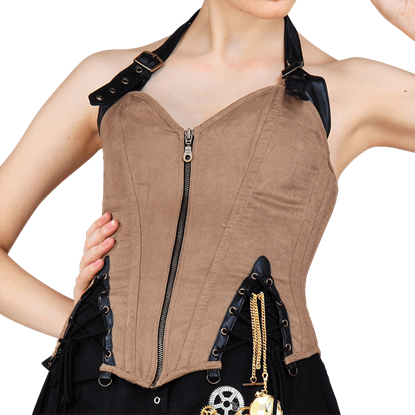 In that regard, this Clasp Closed Chain Steampunk Overbust Corset does not disappoint. Add elegance to any outfit with this sophisticated ladies sweetheart corset. The Cream Brocade Overbust Corset shows off a subtle vintage pattern on its fabric, providing incredible style to your favorite ensembles. 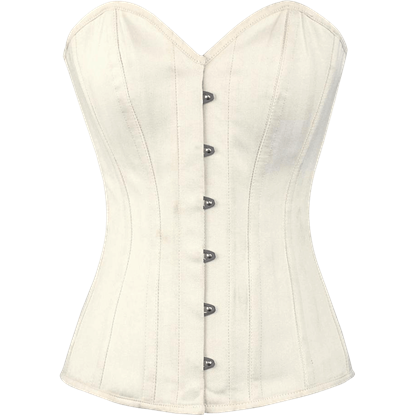 For a sleek hourglass shape with understated elegance, wear the Cream Cotton Herringbone Overbust Corset. This sweetheart bust corset brings a touch of refinement to almost any look without overwhelming the rest of the outfit. Ready for adventure in fashionable steampunk style with the Cream Steampunk Corset and Jacket Set! This brown and cream brocade sweetheart overbust corset has many flexible wear options with its detachable belt and jacket.